Keeping in mind the diverse requirements of the clients, we offer wide range of Aluminum Cabinet Handles that are durable in nature and are corrosion resistant. Our entire product range can be easily installed as per the requirements of our clients and are delivered in well-defined time. They have smooth surface finishing and are delivered as per the exact preferences of our clients. Keeping in the mind the diverse requirements of the clients, we offer wide range of Aluminum Cabinet Handles that are durable in nature and are in adherence as per the set quality standards. We offer them in varied grades and have smooth surface finishing. Our entire product range has high strength and is delivered in standard sizes and dimensions. 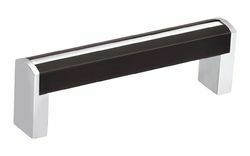 Looking for aluminium cabinet handle ?